Food can both harm and benefit the body. The health and well-being of the whole human body as well as its vigor and activity depend on what and how a person eats. If the balance of the three doshas is disturbed, we can correct it by applying the recipe of the ancient Indian medicine – a dish called kitchari. This dish is used as an excellent means for cleansing the body, and is helpful during the Panchakarma Ayurvedic procedure as well. In addition to intensive and deep cleansing, kitchari helps rejuvenate and restore all the vital forces of the body. Each day, eat kitchari that was prepared on the same day. Take kitchari 3 times a day, as much as you want, but do not overeat. Wait at least 3 hours between meals. It is better not to snack, but if needed, you can have a fruit that pacifies your dosha. Vegetables can be put in kitchari or stewed separately. Last meal should be taken no later than at 6 pm. Be sure to drink at least your norm of pure, warm water (the norm is your weight in kg multiplied by 28.3; output is in milliliters). See How sipping hot water will cleanse your body. Liquids are taken between meals. Moderate exercise is recommended, but avoid overworking. Go to bed no later than at 10 pm. At the end of the cleanse, transition back to your usual diet very smoothly. It helps balance all three doshas. It does not provoke the formation of toxins in the body; on the contrary, it is able to quickly and effectively remove them. It has the ability to purify the aura. It helps the body to cope with complex aging processes. It has solar energy and is wholesome both as a medicine and as a tasty and nutritious food product. Rinse and drain lentils and rice. Next, heat the ghee. To it we add the cumin, ginger, and turmeric in that order. Over low heat, stir until the mixture darkens and has a strong, spicy aroma. Make sure that the spices do not burn. Add rice and mung to the mixture of oil and spices, mixing everything thoroughly so that the aroma is absorbed. Then add water and salt. Bring to a boil, then return to low heat. Kitchari is cooked until the rice and lentils are completely soft ( 20-30 min). You may have to experiment with how much water you use to find a consistency that you like. (The more water, the thinner the consistency). A thinner consistency is preferable if your digestion is weak. You will notice that kitchari will thicken as it cools and you may need more water than you originally thought. Clarified butter (Ghee) helps eliminate toxins from the body, accelerates the treatment of various diseases, slows the aging process, dissolves all the most useful properties of spices and nourishes the body with solar energy. Mung dal (lentils) contains many beneficial minerals and vitamins, and improves digestion and kidney function. Frequent use of this cereal has a positive effect on the nervous system and helps to resist stress. In addition, lentils are an excellent antioxidant. Spices improve appetite, give vigor and strength, and improve blood circulation. If you want, add some vegetables to your kitchari. The best vegetables for Kapha: green leafy, Brussels sprouts, cauliflower, asparagus, celery, broccoli, beets, carrots, cilantro, and chard. The best vegetables for Pitta: cauliflower, cilantro (fresh), sunflower sprouts, alfalfa sprouts, celery, asparagus, broccoli, Brussels sprouts, cabbage, cucumbers, okra, and peas. The best vegetables for Vata: beets, carrots, cilantro (fresh), parsley, seaweed, and sweet potatoes. Pitta: apple, pomegranate, cranberries, dates, figs, grapes, melon, pear, persimmon, pineapple, prunes. Vata: cherries, dates (fresh), figs (fresh), grapefruit, grapes, lemon, lime, mango, papaya, pineapple, prunes, strawberries. 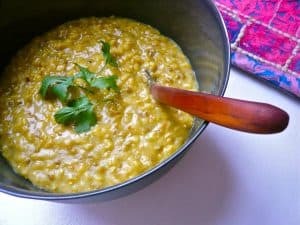 TODAY’S TIP: It is believed that the kitchari recipe came from ancient times and was granted by the highest forces as a means of youth and longevity.